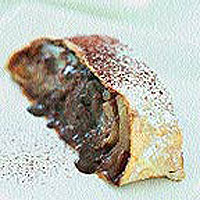 Filo pastry is very low in fat and is ideal for this filling of melted chocolate and soft juicy pears. For best results, use firm but sweet and ripe dessert pears, such as Conference. Preheat the oven to 190°C, gas mark 5. Toss the breadcrumbs with the spice and toast lightly under a moderate grill. Toss the pears with the chopped chocolate and sugar. Unroll the pastry, but keep well wrapped in clingfilm or covered with a clean, damp cloth. Place 3 sheets of pastry, slightly overlapping, on the work surface, and brush with a little beaten egg white. Cover with another 3 overlapping sheets, brush again with the egg white, then repeat. Scatter the pear and chocolate mixture over the pastry to within 5cm of the edges. Sprinkle with all but 1 tsp of the cocoa powder and then the breadcrumbs. Fold the 2 shorter ends over the filling, then roll up loosely from a long side. Transfer to a baking tray with the join underneath. Using a sharp knife, mark the top in a diamond pattern, taking care not to cut all the way through. Brush with the remaining egg white. Bake for about 40 minutes or until deep golden. Serve warm, dusted with the icing sugar and reserved cocoa powder. To prevent the pears from discolouring after preparation, simply place in a bowl of water with the juice of ½ a lemon and pat dry with kitchen paper before using.